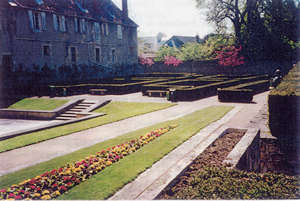 THE ANCIENT WALLS AND THE ABBEY GARDEN IN NEVERS. The ancient walls walk is situated at the foot of the second defence wall of the town. A way through the wall leads to the Abbey garden enclosed by walls. The atmosphere of this place balances betwenn the orderly rightness of the elements of the garden with its enclosure of well-trimmed yew-trees, and the light ochre of the massive frontage of the Frédéric Blandin Museum. Rather closed, almost monastic, this garden only opens itself to the visitor on its very inner side.